The Mina Qaboos Waterfront project ... an artist’s impression. An ambitious project to transform Port Sultan Qaboos into a major tourism-based mixed-use waterfront destination has been launched by Oman Tourism Development Company (Omran), the firm charged with the responsibility of spearheading the sultanate’s tourism-related investment, development and management. The RO500-million ($1.3 billion) Mina Sultan Qaboos Waterfront Project will be developed in four phases, with the first phase expected to be launched in July for completion by 2020. As the master developer of the project, Omran aims to deliver a “truly exceptional waterfront destination”, with the concept benchmarked against world-famous waterfront developments such as the New Cape Town Waterfront. 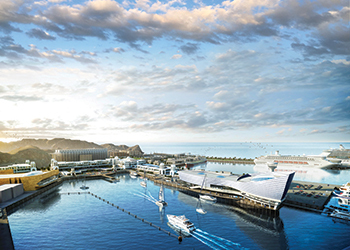 The landmark urban regeneration scheme covers a 101-hectare area in Sultan Qaboos Port and will include business and residential zones, retail centres, seven hotels (three, four and five stars), waterfront promenades, berthing facilities for cruise liners and super yachts, tourist attractions and recreation facilities. The project is expected to be financed in partnership with the private sector, with project funding expected to be secured by July – the date set for launch of works. The development has already received expressions of interest from leading global hotel operators to manage one of the seven iconic waterfront hotels. These include The Address (Emaar), Mandarin Oriental hotel Group, Hyatt, Viceroy Hotels and Resorts, Hilton Hotels & Resorts, Taj Hotels Resorts and Palaces, Banyan Tree Luxury Hotels and Resorts, Chedi and Four Seasons. In addition, Omran’s investor relations unit reports that is in advanced stages of negotiations with a number of private sector entities, state-related entities and investment funds, and has received high levels of interest from Omani and international private sector investors, developers and the banking community, keen to partner in the new project. Omran is set to establish a new company to develop the project, in which it will hold a 51 per cent stake with the remaining to be taken up by pension and investment funds, and private sector investors. He says the development will maintain the heritage and authenticity of the destination while adding modern components to completely reinvigorate the Muttrah Corniche. The project, in essence, is developed for local and global audiences, with all the uniquely Omani heritage and hospitality elements firmly incorporated, Al Ghazali adds. The Mina Sultan Qaboos Waterfront Project is in line with the government’s move towards economic diversification. The master development plan was finalised in 2015 with significant inputs received from private sector investors. Phase One of Mina Sultan Qaboos Waterfront will include a number of entertainment and lifestyle attractions that will generate significant footfall and make the waterfront a day-long visitor experience. Attractions will include leisure and entertainment facilities such as an SME (small and medium enterprises) incubator, arts, crafts and organic farmers market (emporium), a tourism visitor’s centre, boutique and destination shopping, restaurants and cafes, a marine heritage visitor centre featuring the tall ship Shabab Oman, an aquarium and an extensive kid’s entertainment village. Phase One also includes Muttrah fisherman’s wharf, fish suq, a five-star marina hotel with a yacht club and marina, a four-star family hotel, hotel-operated residential apartments, starter apartments for first-time home buyers with extensive parking and park-and-ride locations. Phase Two of the project is planned to commence in 2019, and will include a five-star hotel, a four-star hotel, multi-use conference facilities, a healthcare centre and sports club and residential apartments. The third phase will sees the completion of new wharf and berthing facilities to cater for cruise liners, ferries and coastguard vessels. It will also include an additional boutique hotel, branded residential apartments with retail and hospitality areas. The fourth and final phase includes a budget hotel, logistics zones, an integrated healthcare clinic and an accommodation zone for employees. It is expected that the final construction phase will be completed by 2027. To cater for the influx of visitors to the new waterfront destination, there will also be 6,000 new car-park spaces created over an area of 197,000 sq m, while the total built-up area of Mina Sultan Qaboos Waterfront will be 451,000 sq m, approximately 70 per cent of the total development area. Omran, the leading executive government arm for tourism development in Oman, has a proven track record of delivering world-class tourism and related projects based on its core philosophy of sustainability, transparency and partnering with renowned regional and international investors.